After I upgraded to windows 10 and then promptly uninstalled it a number of issues started to surface with the Windows 7 installation that weren't there previously. One of these was that whenever the digital camera, a Canon IXY 220F, was connected to the computer, it would not be recognised and would have a yellow exclamation mark next to it in Device Manager. Uninstalling the camera in Device Manager and reconnecting it to the computer would fix the problem temporarily, but after a restart the camera would not be recognised again. After digging through the Event Viewer I was able to find the cause of this problem and found a way to fix it. The driver \Driver\WUDFRd failed to load for the device USB\VID_04A9&PID_3241\CD46C13575394641B2D8E11F2312BD28. So what are these WUDFRd and WUDFPf references? 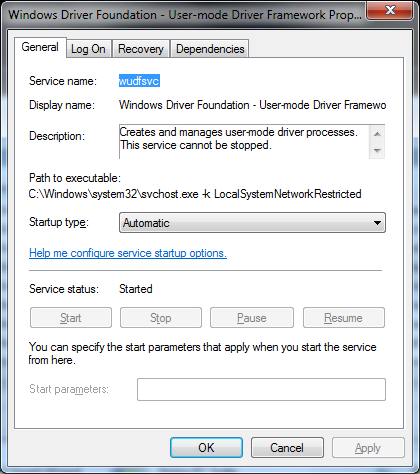 They are to do with the 'Windows Driver Foundation - User-mode Driver Framework' service. Sure enough when I opened the Services Manager, this service was not running and was set to manual start! The Services Manager is started by running services.msc from the Start Menu. The solution is to double click this service and set its start type to Automatic, as shown below. Click Start or restart the computer and the service should be running. Sure enough, after a reboot, plugging in the camera produced expected results - the camera was recognised and I could import images from it.